Hello everyone, I am in the process of building all three sections (as well as the interrogated version) of the Prometheus class from scratch. This is the first canon ship and most complex design I've tried to build to date, so while I'll be doing my best to get it as close to the true design, I admit that it won't be perfect >.<. I intend to model all three sections first, then move to texturing and bringing together the interrogated version. Up first is the Saucer section, which currently stands at 670 polys, though I am considering adding the two large side panels. Comments and suggestions are openly welcome, and even more so are some good pictures of the Prometheus from the Message in a Bottle Episode; those would come in extremely handy for when I get to the texturing part :). Not bad. You know there's already a separating Prometheus out there, though, right? Sorry if that puts a damper on your project. Keep up the good work! Good start, can't wait to see more! CanadianBorg;4740362Not bad. You know there's already a separating Prometheus out there, though, right? I know, but I'm hoping to be able to build one of a bit better quality :) or if nothing else to provide a bit of a diverse selection for the class :rofl:. I'll begin work on the middle section sometime either tomorrow evening or the day after, until then have a fun and safe Christmas everyone :). Perhaps make the nacelles and the struts holding them a bit bigger? Looking good so far though, what textures are you going to use? I would go looking for more Promie pics for you Icewolf132 but I don't think your ganna find a more detailed map of the ships hull than in link The Starfleet Kid gave above. I think it's great that someone is making another Prometheus class with MVAM capability....just please don't make the hull purple :p.
dEjavU';4741691just please don't make the hull purple. Pink? =p As everyone else is saying, its great to see another Prometheus Class being made. 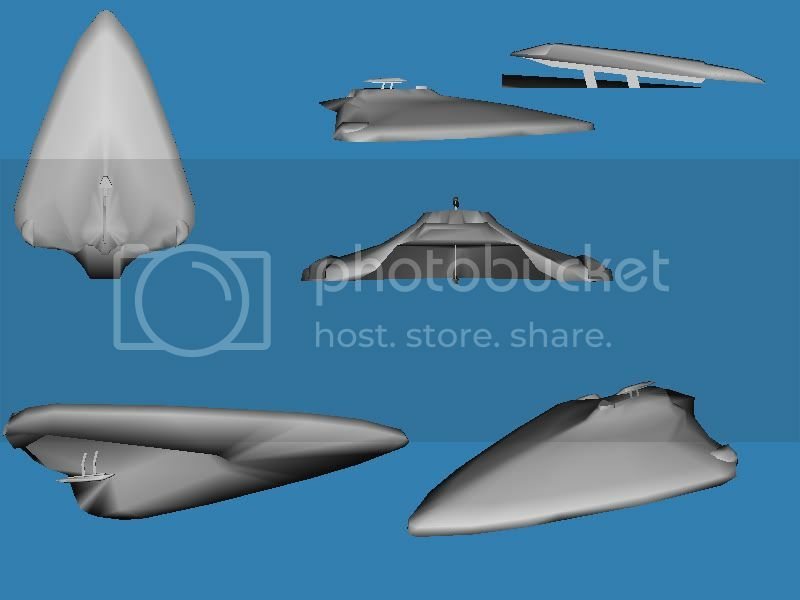 To my knowledge, there are only three versions of the ship avaliable in the community (based around BCFiles, SFCFiles, STLegacyFiles and A2Files). It will be nice to have a forth addition. My only dislike on both the model, and the actual concept, is the lower nacelle on the saucer section. It just looks tacky hanging like that. A lucky photon would blow that away no problem. That wouldn't be your mesh error though, its the way the ship was designed. Transmission;4741698My only dislike on both the model, and the actual concept, is the lower nacelle on the saucer section. It just looks tacky hanging like that. A lucky photon would blow that away no problem. That wouldn't be your mesh error though, its the way the ship was designed. Just to contribute further to this point, I cannot figure out why they didn't design this ship's saucer to have the warp nacelles fold out on the sides (like the Galaxy EVO, only semi-recessed until required). The stresses that inertial dampening / structural integrity fields can deal with --especially post-combat if the saucer is all that survives-- would probably be insufficient to keep this dinky little thing from flying off altogether. Not to mention the utter illogical addition of shuttle-sized warp nacelles to such a sizeable saucer section, while both stardrives have proper warp drives attached. Still, she's canon and she's being given a nice new model here. Carry on, Icewolf. Looks good so far.